Anyone interested in health and exercise knows protein is instrumental to muscle development. It is also staple in a healthy diet, along with carbs and healthy fats. Protein helps to increase energy, improve focus and memory. 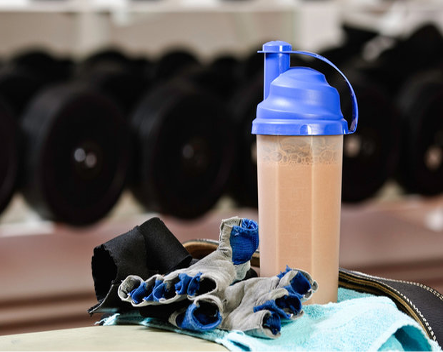 You can get protein from meats, poultry, eggs and fish but sometimes if you're working out daily, it can be a good idea to add in a protein shake to help build muscle. Although there are some ways that the fitness drink can have a detrimental effect on your health. Here are three classic mistakes you're possibly making with the shake. It can be hard to decide which protein to use when you're confronted with aisles upon aisles of protein powder. Sure, you've done some research online but you still can't quite decide which to buy. The two most common protein powders are whey and casein because they are complete proteins and have all the necessary amino acids that make sure you're building and repairing muscle tissue. The trick for picking a protein powder is the less ingredients the better – and the more ingredients that come from real food the better too. Too much protein has been proven to make you gain weight. One long-term study of 7,000 adults found those who ate a diet higher in protein were 90% more likely to become overweight than those who ate less. Too much protein also has the potential to cause kidney damage. When you consume protein you also consume the nitrogen byproducts that your kidneys have to work to filter out of your blood. If you are consuming a regular amount of protein, you pee out the nitrogen. But by overdosing on protein your kidneys have to work harder to get rid of the extra nitrogen. The rule to stick to is 1g of protein per 10lbs of body weight. So a 180lb man would aim for 18g of protein to maintain muscle mass. This is the easiest way to gain fat rather than muscle. If you are loading up your shake with sweetened nut milks or almond butter then you are also loading up on sugar, defeating the purpose of the shake in the first place.